The Second Annual UW Giving Day is scheduled Tuesday, Nov. 29. 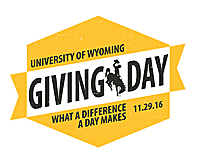 Tuesday, Nov. 29, is Giving Tuesday, and the University of Wyoming honors this tradition with its second annual UW Giving Day. Giving Tuesday, the first Tuesday after Thanksgiving, is a global day of giving fueled by the power of social media and collaboration. Giving Tuesday kicks off the charitable season, when many focus on their holiday and end-of-year giving. It follows Black Friday, when shoppers mob the stores, and Cyber Monday, which is a big day for online shopping. Those who wish to participate can go to the #UWGivingDay website (www.uwyo.edu/givingday) to give online. Giving will be live on the site from midnight to midnight, and gifts made on that day will count toward total fundraising for giving day. Donors choose from among 15 colleges and units on the #UWGivingDay site, or they can click over to UW’s online giving site (www.uwyo.edu/giveonline) and designate their support for the specific programs of their choice. These gifts will have a huge impact on those areas chosen by donors. #UWGivingDay is an online event. Fundraising efforts are supported by social media posts by colleges, units and programs across campus. Participants are invited to share their giving on Facebook and other social media. The tradition of Giving Tuesday connects individuals, communities, and organizations around the world in one common purpose: to celebrate and encourage giving. From its very first year, individuals and organizations have joined forces to collaborate across sectors, to offer expertise and to work tirelessly for a successful annual Giving Tuesday. The movement continues to gain momentum. For questions or to donate through another channel, contact the UW Foundation at foundation@uwyo.edu or (307) 766-6300. Funds received that day are counted toward the #UWGivingDay total, no matter how they are received.